Buckwheat may be one of the healthiest foods you’re not eating. Along with having numerous health benefits, it is tasty, easy to prepare and inexpensive. Energizing and nutritious, buckwheat is available throughout the year and can be served as an alternative to rice or made into porridge. 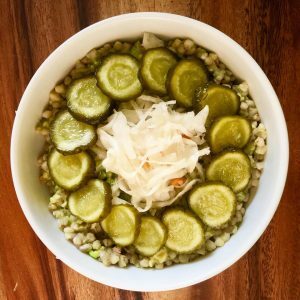 I love to eat buckwheat porridge with sauerkraut and pickles or with fresh chopped tomato and parsley. Basically, you can use your imagination. Soak buckwheat in the water overnight. In the morning preheat buckwheat (if prefer warm), add some salt and black pepper. Serve with sauerkraut, pickles and hemp seeds on top.